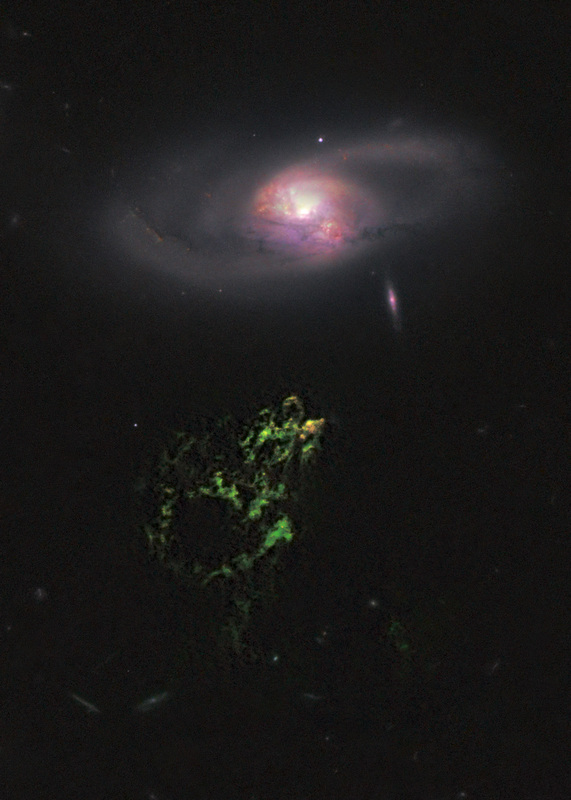 In this image by the NASA/ESA Hubble Space Telescope, an unusual, ghostly green blob of gas appears to float near a normal-looking spiral galaxy. 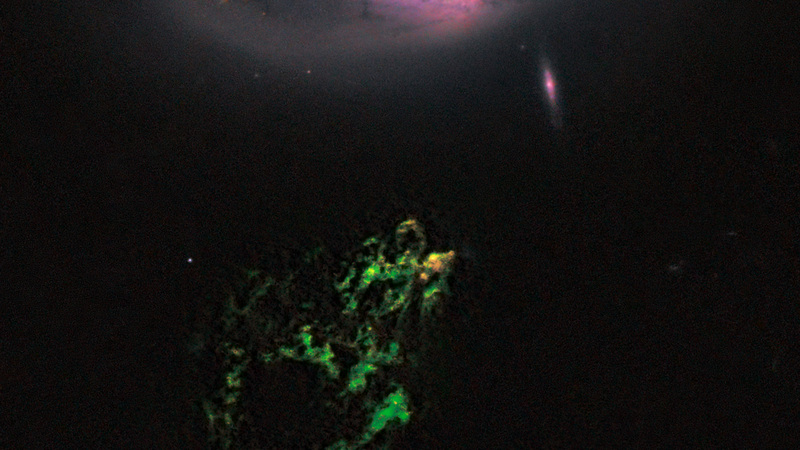 The bizarre object, dubbed Hanny’s Voorwerp (Hanny’s Object in Dutch), is the only visible part of a streamer of gas stretching 300 000 light-years around the galaxy, called IC 2497. 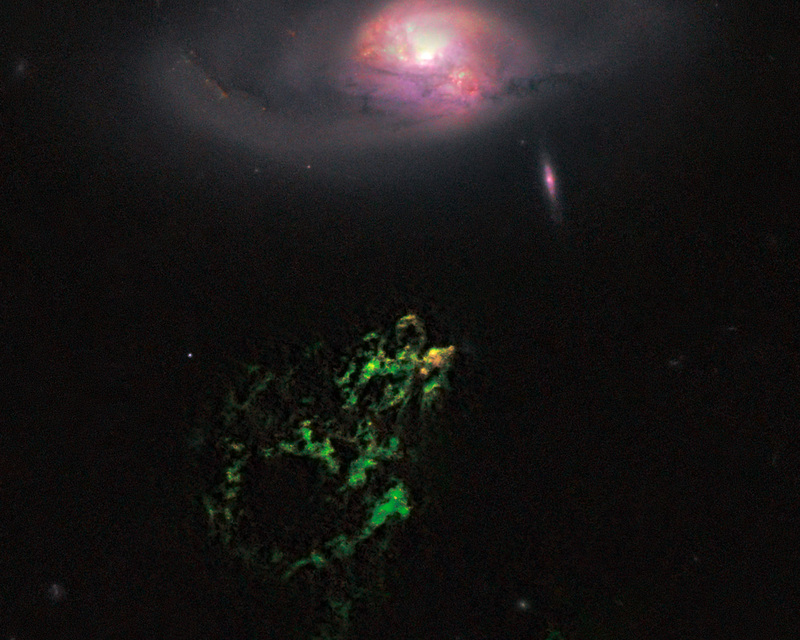 The greenish Voorwerp is visible because a searchlight beam of light from the galaxy’s core has illuminated it. This beam came from a quasar, a bright, energetic object that is powered by a black hole. The quasar may have turned off in the last 200 000 years. This Hubble view uncovers a pocket of star clusters, the yellowish-orange area at the tip of Hanny’s Voorwerp. The star clusters are confined to an area that is a few thousand light-years wide. The youngest stars are a couple of million years old. The Voorwerp is the size of the Milky Way, and its bright green colour is from glowing oxygen. 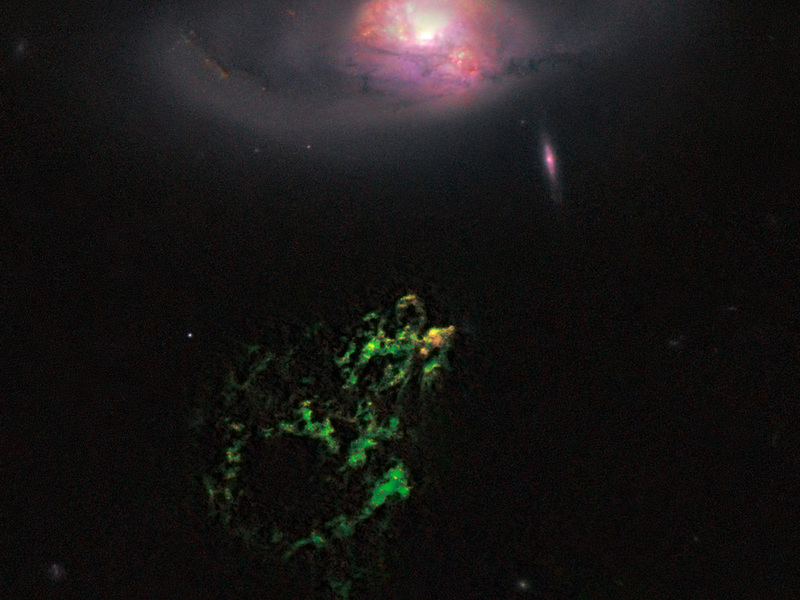 The image was made by combining data from the Advanced Camera for Surveys (ACS) and the Wide Field Camera 3 (WFC3) onboard Hubble, with data from the WIYN telescope at Kitt Peak, Arizona, USA. The ACS exposures were taken 12 April 2010; the WFC3 data, 4 April 2010. Position (Dec): 34° 43' 45.11"